Backs to Black. On a gloomy Dublin day, U2 walk along a canal on the south side of the city. What あなた can't see in the photo? The crowd that gathered on the bridge above the canal to get a glimpse of the rockers.. Wallpaper and background images in the U2 club tagged: u2 bono the edge adam clayton larry mullen jr dublin spin magazine photo shoot. 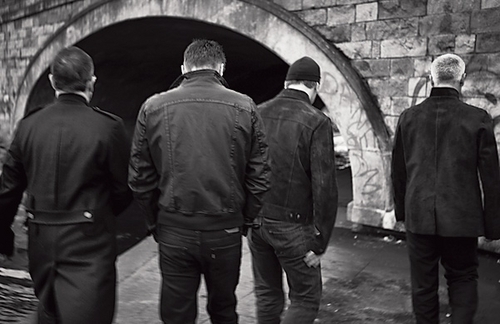 This U2 photo contains 通り, 都市現場, 都市環境, ストリート, 都市, 都市設定, 都市のシーン設定, portcullis, スーツ, and ビジネス スーツ. There might also be 鉄道トンネル, 刑事施設, 刑事, 刑務所, and ペン.